Indian motorcycles has just taken the wraps off the all-new FTR750 flat track racer but MCN was able to get a quick spin on the pre-cursor of the bike with the Super Hooligan Scout Sixty race bikes. 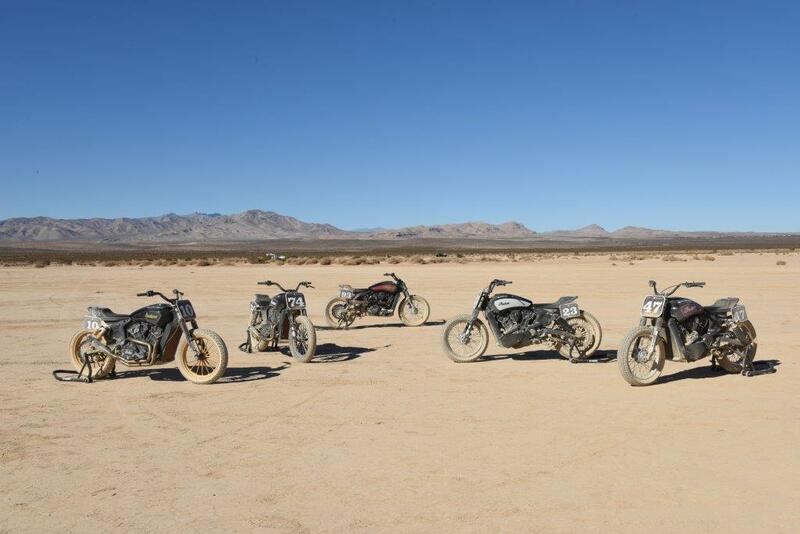 The Super Hooligan bikes were built from the pre-production Scout Sixty road bikes and MCN was invited to ride the bikes on a dried up lake bed near Las Vegas in Nevada while attending last year's launch of the Scout Sixty road bike. Six days until the Brackley Festival! Indian Motorcycles is one of the oldest brands in the world and under the new ownership of the massive Polaris Industries company it's finally getting the chance to express itself; nothing makes that clearer than these Hooligan race versions of the Scout Sixty which MCN was given a chance to ride. 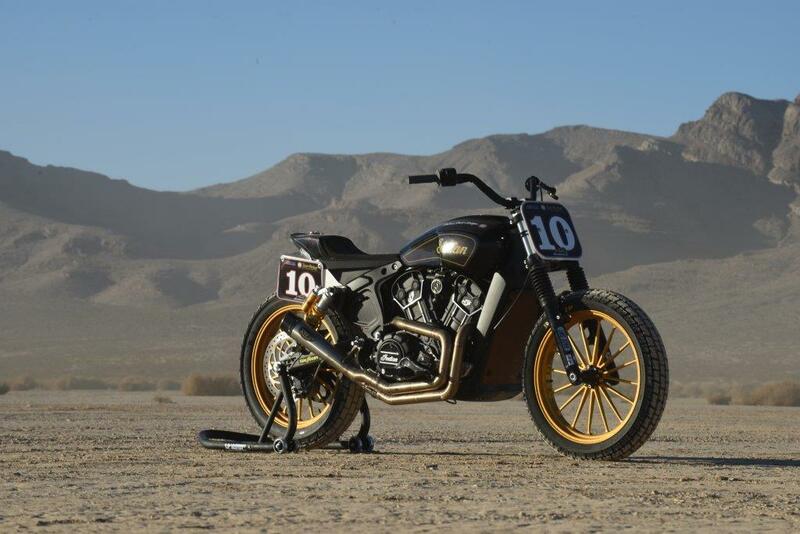 Indian Motorcycles is now entering a second phase in the expansion of the brand into new markets and the existence of the smaller-capacity scout Sixty’s 999cc V-twin heralds the company’s return to AMA flattrack racing along with offering a cheaper road bike for customers too. Alongside the Indian brand is Polaris’s other motorcycle company Victory. As a pair we are going to see them diverge to a large degree over the coming years as Victory is now freed from the shackles of having to match the mighty Harley-Davidson it’s going to tackle the modern performance side of the cruiser market while Indian does heritage. 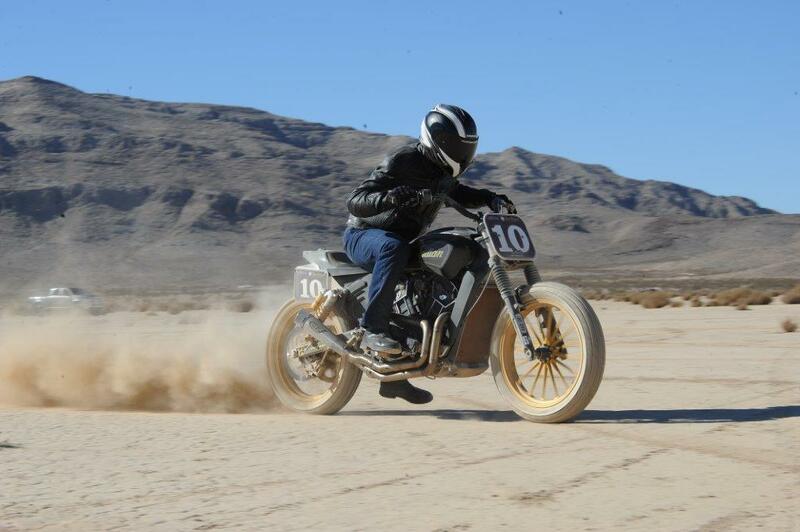 Indian will be entering the AMA Flattrack championships within the next few months with the FTR750. 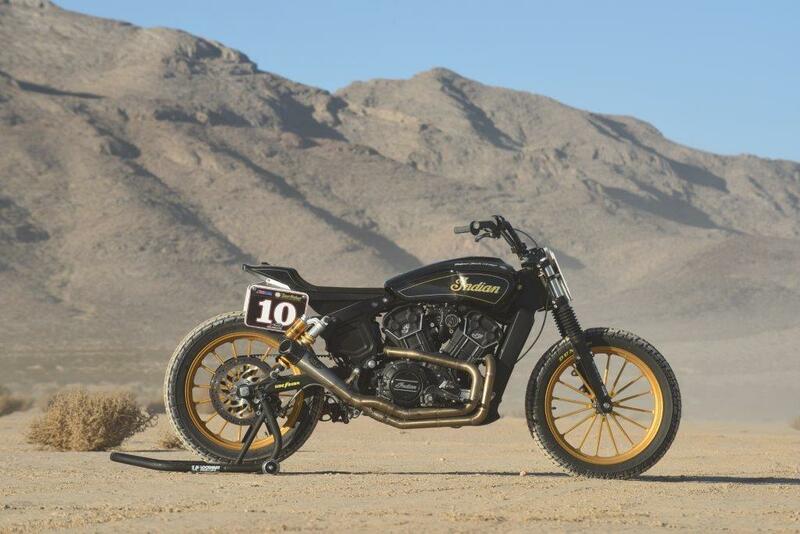 Right now there are five Hooligan race bikes in existence; all built by custom bike guru Roland Sands using pre-production engines and chassis from the new Indian Scout Sixty and they all raced at last year's Super Prestigio of the Americas in Las Vegas, Nevada. 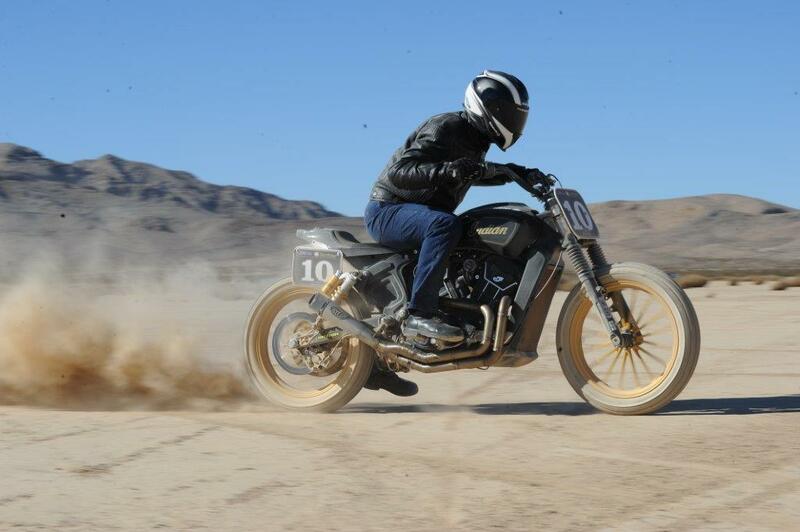 The following morning MCN was among a few motorcycle publications from around the world to get a chance to give the bikes a bit of a thrash across the Jean dry lake bed just outside Las Vegas. The bikes were fairly heavily modified by Sands to include race pattern gearboxes, staggered footrests set-up for the constant left-hand corners of the shale oval tracks they were built to compete at. Oh, and no front brake. The bikes have been stripped back to as little as possible…flattrack style tailpieces replace the standard cruiser mudguards and fat Renthal handlebars give a much higher riding position and the flattrack tyres promise decent off road grip and feel. The bikes feel very purposeful and light. And extremely loud thanks to straight through RSD exhausts. Having access to miles and miles and miles of open dry lake bed was something completely alien to most Brits; myself included. This is US Government owned land and is open to everyone. We were riding on a Sunday morning and dotted around the dusty, windblown expanses were dozens of small gatherings of motocross, enduro and quadbikes. It was amazing to know it was all perfectly legal and above board. Riding the bikes feels a little odd. The riding position is weird because the footpegs are set in different places each side to make the left turns easier. The right footrest is set further back. There’s no front brake or lever and the race shift gearbox (one up/four down) is not overly familiar to me. Firing it up unleashes some furious noise from the open RSD pipe which runs to the right side of the bike. The promise of just around 75bhp from a 999cc V-twin doesn’t sound scary. The fact the surface of the lake bed we are riding on is made up of fine dust with the consistency of talcum powder – even with the flattrack tyres fitted – means the surfeit of power over grip means the bike will wheelspin and slide at will. And when it’s not at my will. In fact, all the time. And when the bike isn’t wheel-spinning and throwing up plumes of dust it locks up the back tyre with a shut throttle and the very instant you touch the back brake. It’s bloody brilliant fun! After 10 minutes of riding; which included a completely flat-out run with the bike bouncing off the rev limiter almost as hard as it was hitting ruts and bumps and throwing me out of the seat, the taste of hospital food and the scent of plastercasts and stitches was becoming overwhelming. Looking at my lightweight leather boots, Kevlar jeans and street jacket and I realised I really wasn’t dressed for the occasion. The attitude of the bike was fantastic fun and if this is one idea of the direction the famous Indian brand is going to be taking for the future then we are all in for a treat.